In this project it was necessary to fit a 2000 KVA transformer into an existing frame of a power center which is used to power the electrical equipment found deep in underground mining. When AC Power Tech of Belle Vernon PA. searched for a reliable transformer manufacturer with the engineering competence to design a low-profile medium voltage transformer to be used in underground mining applications, they turned to MGM. Working in conjunction with the MGM team of a field representative and the Engineering team, and Bill Fragapane of Summit Power Solutions, a new MGM product was developed and manufactured in record time to meet the demanding schedules of the Underground mining market. 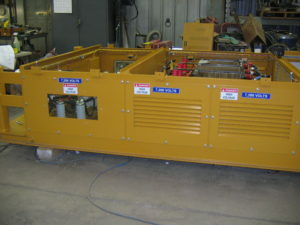 This 2000 KVA transformer (pictured below) carries the dimensions of 30″H x 63″W x 46″D. 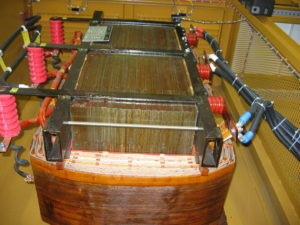 A typical 2000 KVA transformer carries the dimensions of 73″H x 71.5″W x 36″D. The power center shows the transformer installed in the 3rd and 4th bay from the right. This project was a big success. MGM Transformer Company can provide transformers to electrical equipment manufacturers in the world with comprehensive solutions engineered to maximize results.